Leg yielding is the basic lateral movement that we teach young horses. While continuing to move forward with the haunches following the same track as the shoulders, we also ask the horse to move sideways. Rhythmic on-off pressure from the inside leg, driving as the inside hind leg comes off the ground, encourages the inside hind foot and forefoot to reach slightly across the body's midline as the horse continues moving forward. Leg yielding helps horses develop balance, stretch and supple their muscles. By nature, horses tend to move into a physical pressure. So early in the training process, we must teach a green horse to move away from a physical pressure rather than leaning into it. We start teaching this in the horse's stall and in the groundwork we do to prepare the horse for his education under saddle. Gradually the horse learns that if he moves away from a physical pressure rather than resisting it, the pressure goes away. The horse learns that he can relieve a pressure by moving forward away from it or he can relieve it by moving sideways away from it. The concept that moving away from a pressure results in the reward of the pressure going away is fundamental to the application of all of the natural aids we use to communicate with horses when we start riding. Leg yielding teaches a horse that he can go forward and sideways at the same time in response to a leg pressure. It is the simplest lateral movement for the horse to perform because it does not require any bend. Leg yielding is basic to many of the things we ask our horses to do. Consider the green horse on his first few rides in an arena. We may want the horse to move alongside the arena rail or wall but the horse's natural tendency is to dive into the middle of the arena where he has plenty of space all around him. So we use the on-off pressure of our inside leg to encourage him to work closer to the rail. As we start riding our green horse and he becomes accustomed to carrying our weight, we begin to use our inside leg to encourage him toward the arena barrier. The response we get will depend in part on the thoroughness of our ground lessons and in part on the horse's individual temperament. Initially, the horse may angle his body and lead with his shoulders as he tries to move sideways. Or he may move his feet sideways but not forward. If the rider fails to reward any forward or sideways movement by removing leg pressure temporarily, some horses will dive to the inside as they revert to pushing against pressure. We work in both directions, asking the horse to stay on or close to the rail, until the horse understands and responds to the pressures of each leg. When he responds comfortably to inside leg pressure to move forward and sideways staying parallel to the rail, we can start asking for this response in different places. Start on the centerline and move to the rail. Then move from the rail to the centerline. Ride the horse in stair step fashion, alternating four strides straight forward with four leg yield strides. Ride the horse in zigzag fashion with four leg yield strides to the right alternating with four leg yield strides to the left. To ask for a leg yield, the rider sits tall with eyes forward and shoulders parallel to the horse's shoulders. The rider sits with a little bit more weight on the inside seat bone (think 'lower the inside hip'). The inside leg pulses at the girth in rhythm with the horse's strides to ask the horse to move sideways to the outside. The rider drives with the inside leg as the inside hind leg starts to swing forward. This is the only moment when the rider can influence the direction that the inside hind leg will move. The rider's outside leg, slightly behind the girth, can drive the horse forward if necessary. However, the rider should not hold the outside leg steady against the horse's side because this would restrict the horse's sideways movement to the outside. Position the outside leg slightly behind girth, ready if needed to keep the horse's haunches from swinging too far to the outside or to drive the horse forward. The inside rein positions the horse's head so that the eye is slightly visible to the inside. Half halts on the outside rein prevent the shoulders from slipping to the outside. If the rider tightens her thigh muscles and draws her leg up as she applies inside leg, she pushes her weight onto her outside seat bone. This blocks the horse's ability to move sideways to the outside. Some riders collapse at the waist or lean their torso to the inside as they attempt to weight the inside seat bone. Or when riders realize they are weighting the wrong seat bone, they drop their inside shoulder in an effort to counterbalance what they are doing. Either puts the rider's weight on the outside seat bone and blocks the horse's sideways movement. Some riders tense their muscles and brace their feet in their stirrups, pushing their outside leg forward instead of keeping it at or slightly behind the girth. If the rider uses too much inside rein, the horse cannot move forward with its body in a straight line. The horse's neck should stay in the middle of its chest and the rider should see no more than the corner of the horse's inside eye. If the rider can see the side of the horse's face, she is bending the horse's neck with too much inside rein. If the rider tips forward, she lightens her seat and the horse may speed up or slow down instead of moving sideways. 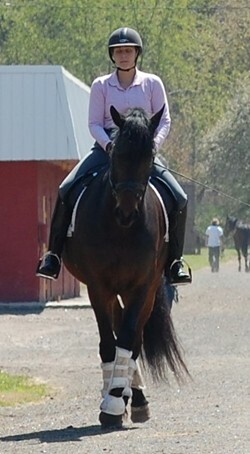 If the rider does not maintain a steady rhythm, the horse will not cross its legs over correctly. A lazy horse that does not move forward rhythmically may not cross over at all. Horses that get quick tend to have tight muscles that make it hard to stretch and cross over. They may quicken their stride to avoid crossing over. While first level dressage tests ask horses and riders to perform a leg yield, leg yielding is primarily a training exercise. Leg yielding into corners or leg yielding out along a circle helps a horse with balance problems. Leg yielding can loosen up short-coupled horses with bunchy muscles and help move them from choppy to swingy strides. Leg yielding helps get the horse listening obediently to the rider's leg aids. Do leg yields at the walk or the trot depending on what the individual horse's conformation and issues may be. Alternating leg yields in the warm up ring is an excellent exercise to get the horse working off the rider's leg aids with relaxation and hindquarter engagement before riding into the ring for a test or class.